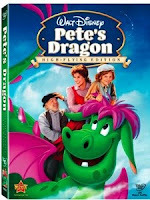 On August 18th, 2009, Walt Disney Studio Home Entertainment released Pete's Dragon: High Flying Edition on DVD complete with many bonus features. This musical is one of the earlier films featuring a combination of animation and live-action. Although I do not recall viewing this movie as a child, my husband recalls enjoying it at least once a year throughout his childhood. This film originally hit the theaters in 1977. Even though I was only 2 or 3 at the time, I still now recognize many of the actors and actresses who helped to make this film a classic, such as Mickey Rooney, Shelley Winters, and Jim Backus. Even though my children have no idea who these legends are, my husband and I fully expected them to enjoy this film. 1) My husband still loved the story as much as an adult as he did when he was a little boy. I think the magic will stay with him forever. 2) I found that this film brought up some topics our 5-1/2 yr old son Jake was not familiar with, such as the purpose of lighthouses, how teachers were permitted to strike children in school, con-artists, orphaned children, greed, and slavery. 3) This musical was very lively and similar to the style of Mary Poppins, except it contained many more displays of physical comedy. 4) Even though the technology was young, I think the dragon Elliott was integrated very well with the live footage. 5) Our 2-1/2yr old twins were too young to watch the entire movie from beginning to end without having their attention drawn to something else several times. Luke did seem to like watching the dragon very much and Makenzie thoroughly enjoyed the singing. 6) Jake found parts of the movie to be entertaining, but I think he is still at the age where he prefers fully animated films. His favorite part of the DVD was actually the extra feature following the movie, which was a short cartoon about Donald Duck working in a lighthouse. My opinion is that this film would be perfect for children slightly older than Jake. I think watching live actors is still not as engaging to children his age or younger as animation would be. 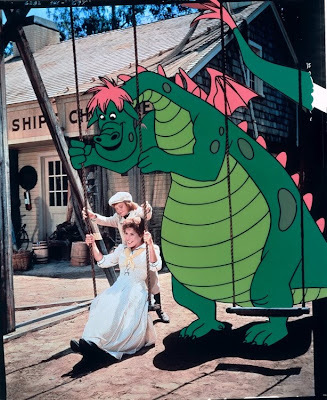 You should be able to find the Pete's Dragon: Flying High Edition DVD at the Disney Store online or locally and at other retailers Disney DVDs are sold. Thank you to Walt Disney Studios Home Entertainment for providing us with a review product free of charge.